IFD: Henry Gilbey needs no introduction, not only a gifted angler but a world class photographer and journalist, Henry is well known for his love of Irish fishing. Henry was one of the first people to give us an interview when we started Ireland Fishing Diaries three years ago, so we decided to catch up again to ask him about his experiences of fishing in Ireland. Henry you have been coming to Ireland for many years now, how did your first trip come about and how did it go? Many moons ago I was starting to hear more and more about Irish shore fishing in particular, and I then got involved in a big book project for a worldwide publishing house and I had to start researching specific chapters to write and photograph. The perfect excuse to visit Ireland and see if the stories I had been hearing were true! I got six Plymouth based anglers together and we headed for the south Clare coastline so we’d have access to the open coast and then the vast expanse of the Shannon estuary in case of dodgy weather, and we caught so many fish that it’s affected me ever since. My love affair with your fabulous country started there and then. You have fished widely around the coast here, what counties have you visited and is there anywhere still on the list? Give me more time and there are countless areas I’d love to fish and visit. I have spend a fair amount of time now around Wexford, Waterford, west Cork, Kerry and Clare, but I’d love to head further north and lose myself in areas such as Galway and Donegal. 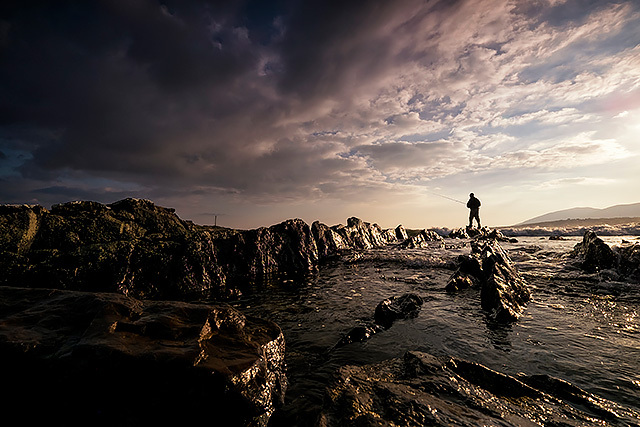 The further off the beaten track the better for me, and I just love the idea of a spinning rod in hand and wandering a deserted coastline on the hunt for say pollack and wrasse. I also have a serious urge to fish some of your islands that just sound so utterly romantic and wild. You must have your favourites so could you tell us about these? 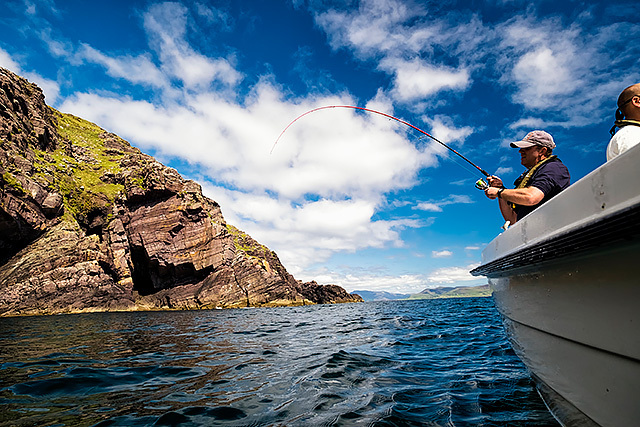 I’m a sucker for “big” scenery areas such as the Beara peninsular and Kerry, but my favourite area to go bass fishing is around the Copper Coast area on the south coast. I have spent a lot of time around there now and when the bass fishing fires I find it hard to look elsewhere. What is your preferred time of year to visit? Depends very much on what I am doing, but for a purely bass fishing based visit? I do like the new moon tides in September and then October if the weather is behaving, but there’s so much more to it than that as you well know. Although you are best known nowadays for lure fishing for bass, do you ever still reach for the bait rods? I keep telling myself to dust down the bait rods, but to be honest I haven’t done so for quite a while now. I find lure fishing and all that it entails so utterly absorbing that I am struggling to see a need to pick up the bait rods for the time being. As much as I love my bass fishing though, give me a lonely rock edge and the deep blue Atlantic and I’ll just as happily chase your pollack population. Over the many trips you have made over the Irish sea, you have made many friends along the way, has this added to the experience? Without a doubt the Irish are some of the friendliest and most welcoming people anywhere on earth, and yes, I am lucky enough to call a number of them my friends now. Yes, very much so, I look forward to seeing my friends when I come over. Sure, I’ve had my fair share of a few individuals taking “exception” to what I do with my working life, but you’re going to get that anywhere you go and do what I tend to do in fishing, and 99% of my Ireland anglers experiences have been resolutely positive. What have been your most memorable trips for good or bad reasons? Too many to mention, indeed each and every trip gives me additions to the memory bank. I remember nearly driving off the road when I saw parts of Kerry and the Beara for the first time, the beauty and scale really got to me. I can think of certain fish that I have caught or seen caught of course, but that’s too easy. One thing that always gets to me is the incredible feelings of anticipation and excitement I feel every single time when I am on the ferry and about to disembark onto Irish soil again………..
You have taken some amazing photographs on your travels over here, is there any particular image that stands out for you? As with the memories, I can’t think of one standout image for me when I have got so many photos here on file from fishing in Ireland that make me really proud. When the light and conditions come good for photography, I would put some of the places I have visited in Ireland up against anywhere on this earth that I have been lucky enough to visit so far. How would you describe the Irish fishing experience to fellow UK anglers contemplating a visit? Quite simply as something that any keen sea angler has to experience in their lifetime. Sure, it can be about plenty of fish when everything comes together, but in truth it’s far, far more than that. I love the mix of fish, fishing, people, landscape, wilderness, far less people than in the UK, and the simple fact that there is so much coastline that I believe simply isn’t seriously fished. What more does an angler want? Have you any trips planned to come over this year? Yes! 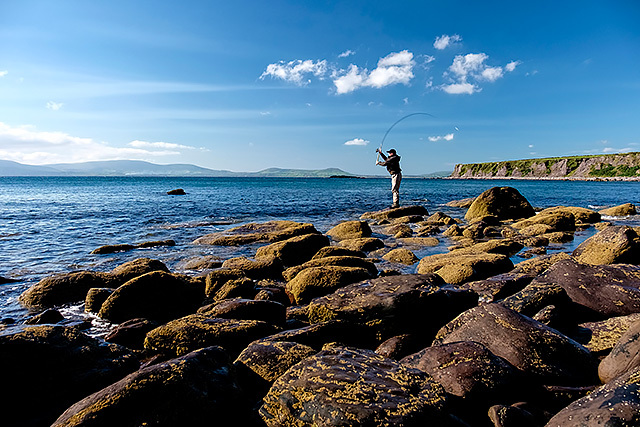 A couple of Kerry based co-guiding trips for starters, and then three bass fishing/photographed based trips in the diary so far, with other visits planned to try and coincide with tides and conditions. In my dream world I’d love to mooch around the west coast in a campervan for say six months. How cool would that be? 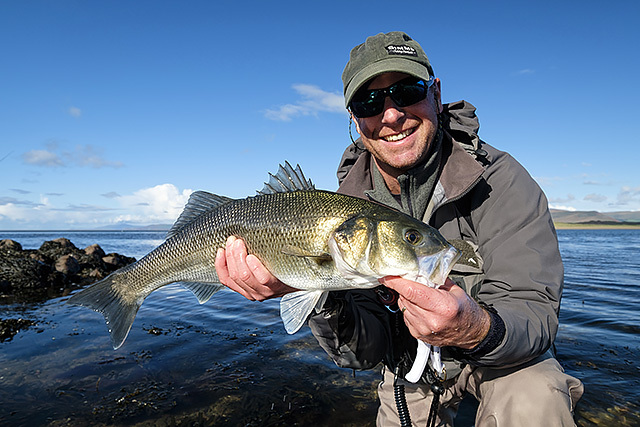 This entry was posted in Interviews, Shore fishing and tagged bass, Henry Gilbey, Ireland. Bookmark the permalink.